In preparation for this week's Crimefest 2015 in Bristol, I've been flipping through a number of translated crime novels by authors who will appear at the festival. One of the books stands out from the rest for the fluency of its English rendering, so here's a salute to the translator, Don Barlett, whom I first met at Crimefest in 2009. 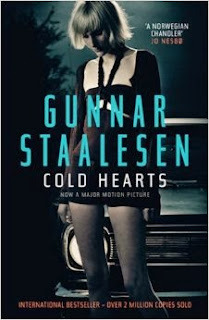 The novel in question is Cold Hearts, by Gunnar Staalesen (whom I first met at Crimefest in 2012), and I am going to buy it on the strength of the easy flow of its English. Not once in its opening pages did I stop at a word or phrase that did not seem quite right, wondering if the fault was the author's, the translator's, the editor's, or the publishers. One edition of Cold Hearts carries a declaration by Jo Nesbø, another author translated from Norwegian into English by Bartlett, that Staalesen is "a Norwegian Chandler." The novel's early pages suggest that the comparison is a good deal less fatuous than such comparisons tend to be. Those pages are rife with wry humor and romanticism that might not have reminded me of Chandler had I not been prodded (this is no mere Chandler parody to pastiche, that is). But having read Nesbø's testimonial, I can well understand why he said what he did. You make the case for "the fluency of its English rendering" when commenting upon translated works, and I suppose that matters more than faithfulness to the original; however, the real delicate balance seems to combine both qualities. In your opinion, whose work has been best translated into English in the past few decades. As for me, I am partial to Indridason's novels. Camilleri's also deserve special recognition. I know, too, that Arnaldur's English translator, Bernard Scudder, was much mourned by at least one of his authors when he died in 2007. A good literary translation should read so well that the reader is unconscious of reading a work in a language other than the one in which it is written. That may be one reason I appreciate good translations only after I've read less-good ones. I should emphasize that "bad" refers to the translation's literary quality rather than its fidelity to the original. I'm not qualified to judge the latter.